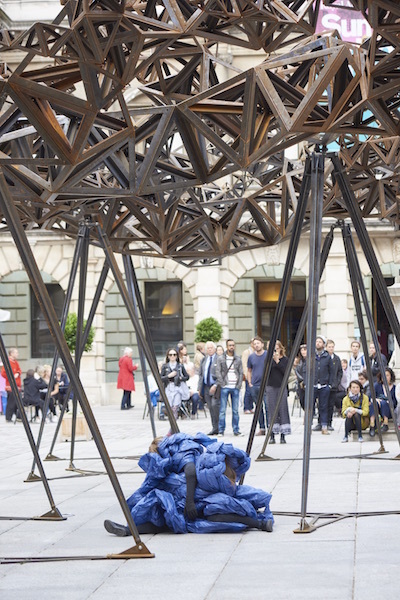 In Do-Re-Me two figures, wrapped around each other and within swathes of tarpaulin, roll across the RA courtyard. 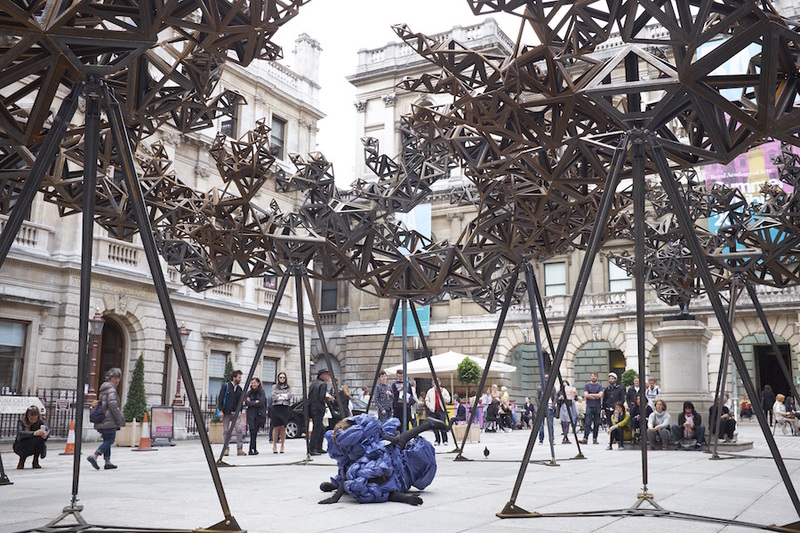 Creating a mass that appears both familiar and strange, the performers’ fragmented limbs flail and reach for movement, continually destabilising and transforming the integrity of each body’s form. 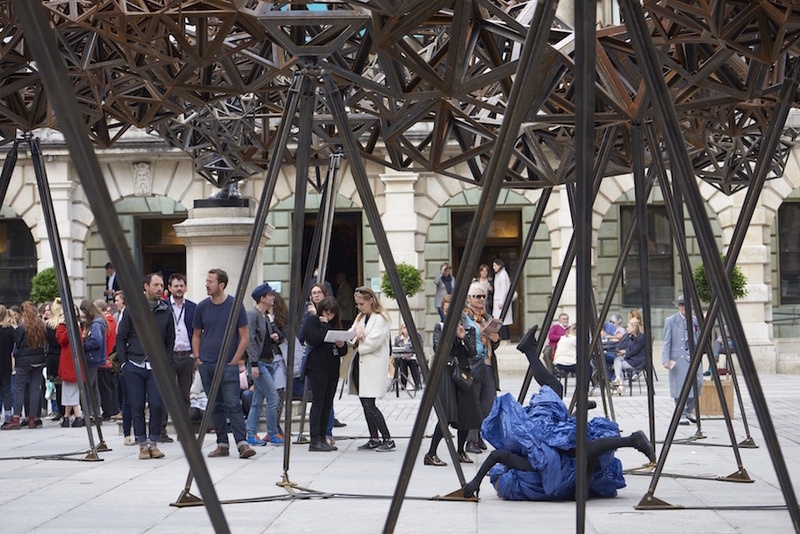 At once compelling and playful, Do-Re-Me mines the relationship between people, space and matter, and through these qualities converses with Conrad Shawcross’ sculptural installation The Dappled Light of the Sun. Nicola is a London-based choreographer making work for theatres, art galleries and other places. Her work engages choreographic processes to explore the potentials of how bodies relate, investigating states of exchange between people, duration, place and further materials. She is particularly interested in the politics of performance, and in the nature and potentials of spectatorial exchange. Her work often investigates notions of theatricality, public appearing and social choreography. In 2015 Nicola was given the biennial Bonnie Bird New Choreography Award to embark on new research exploring experiences of bodied excess and contagion. She is part of Sadler’s Wells Summer University 2015 – 2018, led by Jonathan Burrows & Eva Martinez. From 2009-14 she was an Associate Artist with Nottingham based dance agency Dance4. Her work has been shown at venues including: Hayward Gallery, London; Royal Academy of Arts, London (Block Universe Festival); ANTI Festival of Contemporary Art, Finland; Nottingham Contemporary, Nottingham; Laban Theatre, London; Purcell Room, London and many others. Nicola has a PhD from Laban, her thesis was entitled Audiences, Choreography, Publics: The Politics and Practice of Spectatorship. She is a Senior Lecturer in Dance at Coventry University and a Visiting Lecturer on the MA:Body in Performance at Trinity Laban Conservatoire of Music and Dance. Nicola has collaborated with a range of artists and regularly works with dance artist Helka Kaski and dramaturg Martin Hargreaves.